After two death-defying improbable wins in San Francisco, it was unlikely that the Washington Nationals could keep that up for the entire four-game series. Indeed, they fell flat on Saturday and on Sunday, settling for a mere split in the big showdown series against the Giants. On Saturday the Nats took an early 3-0 lead, of which two runs came on an Anthony Rendon home run to deep left center field. Could the Nats manage to sweep the Giants in a road series? The Nats' rookie pitcher Reynaldo Lopez did better than his first MLB outing last month, but unfortunately he couldn't hold the lead, and was taken out after four innings. With the score 3-3 in the seventh inning, the Giants loaded the bases, and then scored on a sac fly. Oliver Perez then replaced Yusmeiro Petit on the mound, and he in turn was replaced after loading the bases again with a walk. Blake Treinen, who is usually prettty solid, did likewise, walking in another run. Final score: 5-3. Sunday was more of a disappointment, in part because the Giants' pitcher Matt Cain has been struggling for much of this year. This time, however, he was like his old self, as the Nats only got three hits off him. Gio Gonzalez did his job as starting pitcher well, but two errors by his team mates proved lethal. He left the game after six innings with the Nats behind by one run. The Giants scored once more in the seventh inning, and won the finale of the series, 3-1. That 2-2 series split gave the Nationals a 13-12 record for the month, as you can see on the newly-updated Washington Nationals page. With so many home games in July, they should have done better. The Nationals will face the Giants again this coming weekend in Washington, for a three-game series. They were lucky not to face Madison Bumgarner in San Francisco, but MadBum will probably pitch a game in D.C. That will determine the regular season series victor, but there's a good chance that the two teams will face each other in a postseason series this October. After a quick flight to Phoenix, the Nationals got off to a good start against the Diamondbacks last night, with a four-run rally in the first inning. Stephen Strasburg gave up only one run on 3 hits over six innings, while the Nats kept piling on more and more runs. Daniel Murphy, Wilson Ramos and Strasburg himself each got three hits, but nobody hit a home run. Final score: 14-1. It was the Nats' highest run total and biggest victory margin of the season, and their biggest run total without a home run since July 13, 2007, when the Nats beat the Marlins 14-10 in Miami; see baseball-reference.com. As the non-waiver trading deadline came and passed yesterday, the Texas Rangers and Cleveland Indians were the most active in last-minute trades. The Rangers got Jonathan Lucroy from the Brewers, and aging slugger Carlos Beltran from the Yankees, in exchange for valuable future prospects. The Cleveland Indians acquired closing pitcher Andrew Miller (a left-hander) from the Yankees, and outfielder Brandon Guyer from the Rays. (Lucroy had exercised his option to reject a trade to Cleveland.) Meanwhile, the Cubs added left-handed pitcher Mike Montgomery (from the Mariners) to their bullpen, after getting closer Aroldis Chapman from the Yankees. On the west coast, the Dodgers sacrificed some hot prospects to get pitchers Rich Hill and Bud Norris, as well as outfielder Josh Reddick, a possible replacement for the tempermental Yasiel Puig. Their rivals the Giants acquired pitcher Matt Moore in a trade with the Rays, as well as infielder Eduardo Nunez (an All-Star) from the Twins. See MLB.com. Some people were surprised that the Washington Nationals did not pursue a slugger or another relief pitcher (besides Mark Melancon) more aggressively. Apparently Mike Rizzo is confident that his current roster can regain their former batting zest and make a run to the World Series. I tend to share their stand-pat approach; we'll see how it turns out. The League Park diagrams have been revised, and there are two brand-new variants, showing the uncovered upper deck and lower deck, respectively. Those diagram variants allow the support beams and entry portals to be shown in for the first time, as well as a narrow lateral walkway behind the second row of the upper deck (in the infield portion only). Also, there is now a dark gray line showing the peak of the roof, as I have done for stadiums with a similar roof profile such as Wrigley Field -- both of them, actually. (The other such stadiums: Baker Bowl, Griffith Stadium, Shibe Park, and Tiger Stadium) Also, the bullpens are rendered with more detail, and the additional rows of seats added along the foul lines in the late 1920s or early 1930s are more accurate than before. Some photos indicate that those addional rows originally extended straight along the respective grandstand; later on the outer portions thereof were angled inward, creating a small gap betwen them and the permanent grandstand. Finally, I added two more photographs (which I took in 1998) to that page a few months ago, in case you haven't seen them yet. This was the first revision of League Park diagrams since December 2010. I became aware that the Cleveland Rams played football there before moving to Los Angeles, but I haven't seen such a photo yet, so I will put off doing a football diagram for the time being. But on a related note, I did find a good photo of hockey rink that was installed at Progressive Field in January 2012, so I made such a diagram. And speaking of Progressive Field, I have concluded that there was no change in the outfield dimensions when the "405" marker in center field was replaced with a "400" marker a few years ago. For the time being, I assume that the current marker is mistaken. This means that Cleveland becomes the latest city for which all of my baseball stadium diagrams are up to date: League Park, Cleveland Stadium, and Progressive Field. The other such cities: Chicago, St. Louis, Kansas City, Milwaukee, Philadelphia, San Diego, Seattle, Phoenix, Denver, Arlington (TX), St. Petersburg (FL), Miami, and Toronto. What about San Francisco? I may have to make some tweaks to the Candlestick Park diagrams... As you can see, I am making quite a bit of progress toward the ultimate goal! The Washington Nationals followed up their lopsided victory over the Arizona Diamondbacks on Monday with two more big wins. On Tuesday night (late!) they scored in the top of the first inning again, but only one run this time. The Diamondbacks quickly replied in kind, and after two innings had a 2-1 lead. The Nats tied it in the fourth inning, and in the fifth inning Wilson Ramos came up to bat with two runners on base. BOOM! In a clutch situation, he delivered big-time with a three-run homer. Then on the very next pitch, second-string right fielder Chris Heisy (subbing for Bryce Harper) hit a line drive homer to left, giving the Nats a four-run lead. Jayson Werth later hit a solo homer, and Tanner Roark had another fine outing, leaving the game after 6 1/3 innings. A big part of that game was rookie Wilmer Difo (playing second base), who went 3 for 5 with one RBI. Final score: Nats 10, D-Backs 4. On Wednesday afternoon, Max Scherzer took the mound, and in the early innings it was a real pitchers' duel. In the third inning, rookie Trea Turner got his first homer of the year, a 451-foot blast that almost cleared the seats beyond deep left center. But in the top of the fifth, he helped himself by smashing a two-run single up the middle, and the Nats took a 4-1 lead. The D-Backs closed the gap to 4-3 over the next two innings, but Scherzer hung tough and finished eight full innings, with 11 srikeouts. In the top of the ninth, Danny Espinosa hit an RBI double to right field, and the Nats piled on three more runs against the hapless Arizona bullpen. Daniel Murphy had a scond straight multi-hit game, raising his batting average back up to .358 -- tops in the NL, and just behind Jose Altuve of the Astros in the AL. Final score: 8-3. The Nats racked up 32 runs in that three-game series, their biggest such total this year. They scored 31 runs on June 5-8, during a road trip against, respectively, the Reds and the White Sox. * At Nationals Park on the 4th of July, 2011 I saw Cubs pitcher Carlos Marmol throw a wild pitch to Ivan Rodriguez, allowing Jayson Werth to score the winning run from third base in the tenth inning. I spent much of the day developing a new Web page that should be finished tomorrow. Those of you who are familiar with my Web page navigation system should be able to find it if you're really curious. I'll be doing some Web site maintenance in the next few days, such as updating the Stadium diagrams page, which shows how many diagram variants there are for each stadium -- multi-year, football, lower-deck, etc. New!!! After many hours of graphical drudgery, I have finished a brand-new Web page that allows you to compare the profiles (side views) of all current and past MLB stadiums: Stadium profiles. It's one of those projects I've had on the back burner for many months (or years, in this case), and I think I figured out an ideal way to present the graphical information. The profiles are twice the size of the profiles that are seen in the corners of each stadium diagram, and in each one the front edge of the grandstand is "anchored" to the same exact spot, with the same field level for all of them, or almost all. That allows you to compare the total height of the stadiums, or the height of each respective deck. In some cases, such as Yankee Stadium and Wrigley Field, the field was lowered at one point in time, complicating matters slightly. There are presently two such profiles each for Yankee Stadium and U.S. Cellular Field, since both of those grandstands were rebuilt. I may add a second (early years) profile of Wrigley Field later on. In some cases, such as Shibe Park or RFK Stadium, there are multiple profiles, just as there are on the diagrams on those pages. I decided there wasn't much point to including a second profile for outfield bleachers. Bear in mind that some of those profiles are more accurate than what are currently displayed on the diagrams themselves, several of which are still in the process of being refined and enhanced. (See the current list of "Coming Attractions.") As I finalize the rest of those diagrams over the next few months, I may have to revise those profiles as well. For example, I suspect that in my Camden Yards diagrams, the profile may be a bit too short. Note that there is a link with a mobile device icon ( ) near the top of the new page. Clicking on the link toggles between desktop display mode and mobile display mode. In desktop mode, you generate dynamic diagram effects by rolling your mouse over the link, and clicking on the links takes you to the page in question. In the latter mode, where there is no mouse rollover, tapping on the links does NOT take you to that page. For now, mobile display mode is suitable for larger devices such as iPads but not for smart phones. I will work on making that page more accessible to smaller devices in the next couple days. Murphy & Strasburg: NL Player & Pitcher of the Month! Daniel Murphy was chosen as National League player of the month, and Stephen Strasburg was chosen as NL pitcher of the month. It's just like May of last year, when Bryce Harper and Max Scherzer were chosen for those monthly honors; see June 8, 2015 (scroll down). Murphy had a .346 batting average in July, maintaining the #1 ranking in the National League, and he hit six home runs. Plus, he got two hits in the All-Star game. Murphy previously received that honor in May, after Bryce Harper was chosen in April. Strasburg had a 4-1 record in July, and it's ironic he received the honor in a month during which he lost his only game! But the dominance he displayed was unquestionable, holding opposing players to a .127 batting average in July. It was the second time Strasburg won the NL Pitcher of the Month award, the first being in April 2012. See MLB.com. Tonight the Nationals welcomed the San Francisco Giants to Our Nation's Capital, after a fairly successful 6-3 road trip out west during which they went 2-2 against the Giants. The Nats started off on the right foot with three hits and two runs in the first inning, and added three more runs later on, with solo homers by Trea Turner and Wilson Ramos. It was Turner's second homer of the year and the second of his last two games! On the mound, Gio Gonzalez had his best outing of the year, giving up just two hits (one a solo home run) over seven full innings. The Giants threatened in the eighth inning, but Sammy Solis got three outs without allowing a run. The Nats' new closing pitcher Mark Melancon pitched a 1-2-3 ninth inning, but it wasn't a save situation. It was his first appearance in Washington since being traded from Pittsburgh, and the home crowd gave him a warm welcome. Final score: Nats 5, Giants 1. In the southern hemisphere this evening, meanwhile, the opening ceremonies of the 2016 Olympic Games were held in Rio de Janeiro. There a somber background to the pomp and gaity, as Brazil is suffering a series of simultaneous crises: economic (major recession), political (impeachment of the president), and public health (the Zika virus). Anyway, I suppose this means I'd better get to work on my Olympic Stadium diagrams, as I did four years ago... Since I have some interest in major sports stadiums in Latin America, I may have something to say about Brazil's big stadiums. I wrote a brief piece on "Baseball in the Olympic Games" in August 2008, the last time the Olympics included a baseball competition. Baseball will return to the Olympics four years hence, when Tokyo hosts the quadrennial sports extravaganza. This time of year the neotropical migrant songbirds are all molting or just conserving energy in preparation for their big southbound journey next month, so it's unusual to see many of them. Obviously, I didn't have high hopes, but I just had to get away from the stifling heat and humidity today, so I drove west on Route 250 all the way to the Highland County line. On the way there, I stopped at Ramsey's Draft, where I saw a Hummingbird and heard some Cedar Waxwings and a Wood Thrush, but not much else. Once I reached the parking lot at the Confederate Breastworks at the summit, I decided to hike north on the Shenandoah Mountain trail, about a half mile or so. I heard an Eastern Wood Pewee, some Red-eyed Vireos, and saw some Black-capped Chickadees, Goldfinches, Turkey Vultures, and finally a family of Indigo Buntings. Satisfied with getting this photo, I decided to turn back and call it a day. I did get some nice mushroom photos along the trail, to be posted later. Indigo Bunting (male), on Shenandoah Mountain, August 6, 2016. Meanwhile, there have been continued reports of the two Sandhill Cranes north of Fishersville, as well as a Snowy Egret, and I have gone out there two or three times in the last week, just in case. No luck with either of those, but I did get some nice closeup photos of a Great Blue Heron, possibly a juvenile. Great "Blue" Heron, on Kiddsville Rd., July 31, 2016. Finally, I have been keeping tabs on the Green Heron family in the flooded ravine on the north end of Bell's Lane, and the young ones have already lost their "fuzz." Thus far, I have had a hard time getting good photos, however. See the Wild Birds yearly page. What an incredible game that was today! In another pivotal matchup of presumed postseason-bound teams, the Washington Nationals managed to eke out a win over the visiting Giants, taking the series two games to one. Combined with the recent four-game series split in San Francisco, the Nats ended up with four wins to the Giants' three. That may prove to be decisive in getting home field advantage if those teams face each other in October. Going up against Madison Bumgarner, the Giant's ace pitcher for the last two years (if not this year), Tanner Roark faced what was probably the biggest challenge of his big league career. The way he handled himself under repeated high-stress situations was magnificent, a good sign that Dusty Baker can count on him in the postseason. He was helped by fine defensive plays. In the sixth inning, second baseman Trea Turner executed a tag-toss double play. In the seventh inning, first baseman Daniel Murphy muffed a ground ball, allowing runners to reach second and third. The next batter, Brandon Belt, smashed a towering fly ball all the way to the corner in center field, and somehow Ben Revere managed to chase it down and catch it for the third out. Otherwise, the Giants would have had a 2-0 [lead] and most likely won the game. Revere's catch really changed the momentum of the game. Bumgarner held the Nats hitless until the fourth inning, when Anthony Rendon doubled. The only other hit he allowed was in the seventh inning, when Wilson Ramos hit a home run that just cleared the high scoreboard wall in right field. Shawn Kelley got three quick outs in the eighth inning, and in the ninth inning the Nats' new closing pitcher Mark Melancon faced his first big test. He came through with flying colors, getting a groundout and two strikeouts to end the game. That game will surely become a MASN "Nats Classic"; see MLB.com. Nats 1, Giants 0. Last night, Stephen Strasburg suffered a rare lapse. The early innings went fine, but in the top of the fourth, Eduardo Nuñez hit a leadoff triple, and three other Giants hit singles to take a 2-0 lead. They got two more runs in the fifth inning, and Strasburg was taken out of the game. The Nats finally scored on an RBI single by Danny Espinosa in the eighth inning, but the Giants kept adding runs, and won the game easily, 7-1. It was a mirror image of the Nats' 5-1 win the night before. There was a scary incident when Hunter Pence hit a foul ball straight down, which then bounced back up and struck his cheek bone. That left him with a big contusion, and he still had a black eye today, when he came in to pinch hit in the ninth inning. So, given the pitching matchups in that three-game series, the game results were almost the opposite of what one might have expected. Strasburg now has a 15-2 record, still the best in the majors, and still on track to exceed 20 wins by the end of the regular season. When the New York Yankees announced yesterday that Alex Rodriguez and General Manager Brian Cashman would hold a special news conference, most people had a pretty good idea what was coming. A-Rod has had a lousy year, and it just doesn't make sense to keep him on the roster when he is getting so little playing time. The Yankees are already rebuilding for future years, and the 41-year old is obviously not part of their plans. After playing his last game this Friday, he will become a "special advisor and instructor" for the Yankees until the end of 2017. See MLB.com. A-Rod came up to the majors with the Seattle Mariners in 1995, the year they first made it to the postseason. Five years later he became a free agent, and I remember when the Texas Rangers signed him to a gargantuan long-term contract in December 2000, and whether the team could afford such a high payroll. Obviously not, as the Yankees acquired him in a mega-trade in February 2004. (I had forgotten that the Yankees sent Alfonso Soriano to Texas in exchange; Who's Who in Baseball is a very handy reference guide!) Rodriguez had been a shortstop, and had to move to third base because shortstop was Derek Jeter's position. This was the prime of his career, and A-Rod was the American League Most Valuable Player in 2003, 2005, and 2007. After filing for free agency that October, he then signed a new contract, lasting ten years. But meanwhile, suspicions of dope usage were growing, and he was spending more and more time on the disabled list -- a tell-tale sign of steroids. (When I saw the Yankees play in Kansas City on August 16, 2011, he was on the DL.) In August 2013, A-Rod received a 211-game suspension, which was later extended to 162 games (the entire 2014 season) after he appealed the ruling and heatedly denied the charges. But nobody believed him. (Well, not many.) To his credit, once he returned to the Yankees lineup in 2015, he played hard and played well, showing a new, humbler attitude. He hit 33 home runs, his most since 2008. But this year, he has only hit nine homers, so he will retire with a total of 696* home runs, fourth on the all-time list, depending on how you count Barry Bonds... He's a tragic figure symbolic of our times -- like Icarus, the superhero who reached too high and was burned. Speaking of home runs, at mile-high Coors Field in Denver yesterday, Giancarlo Stanton hit the first home run over 500 feet this year, but the Rockies still won (12-6), so the Nationals retained their 7-game lead in the NL East. Stanton's team mate Ichiro Suzuki hit his 2,999th career hit in that game. (More on him tomorrow!) The initial "official" measurement was 504 feet, but I'm dubious. If you watch that video and refer to my Stadiums superimposed page, you'll see that the ball traveled about 465 feet before landing, and the trajectory suggests that without any obstruction it might have gone another 15 or 20 feet. According to hittrackeronline.com, the "true distance" of that homer was 495 feet, which is 10-15 feet more than my estimate. The list of his homers for this year includes the one on May 6 at Marlins Park, which I vividly recall. That ball he hit actually reached the open concourse area above and to the left of the big Art Deco feature in center field. While hiking in the mountains yesterday, looking for birds, I came across quite a variety of mushrooms, and I posted a "sampler" montage of the best photos I took on Facebook earlier today. The variations in color, shape, and size were indeed "magical"! I have a mushroom field guide, but it pertains specifically to southern states, and I'm not sure if it includes mushrooms seen in the highlands of Virginia. I may need to get a more complete field guide. So, I will have to postpone identification of the species below until another day... I previously posted such a montage in my July 16 blog post about birding, and before that on July 18, 2013. Otherwise, I was surprised after checking my blog archives that I had not done more such mushroom montages, or individual species photos. I'm pretty sure I took a photo of a rare "Dog Stinkhorn" mushroom two or three years ago. Anyway, I updated the Mushrooms photo gallery page, for the first time in quite a while. Mushroom montage, Shenandoah Mountain and Chimney Hollow, August 6. * Obviously, that title is an allusion to the Beatles' album Magical Mystery Tour, and to the fungus species Psilocybin. (See dea.gov for more information.) But the original inspiration for my interest in mushrooms was a presentation by a nature photographer from Mendocino, California named Taylor Lockwood which I saw in Charlottesville in 1999 or so. (It was possibly at a Monticello Bird Club meeting, but I forget.) I was so awestruck by his dazzling, magical, exotic photos that I bought a set of jumbo-sized postcards he published, and I still have a few of them left. Thanks to Google, I found his photo gallery Web site: fungiphoto.com. One day after Giancarlo Stanton's tape-measure home run in Denver, there was another historic feat at Coors Field yesterday: Ichiro Suzuki got his #3000th hit in the major leagues, the 30th player ever to do so. The last such player was Alex Rodriguez (soon-to-retire), who hit a home run on June 19, 2015. I was watching the Sunday game live on the MLB network during Ichiro's third at bat, but not during his fourth at bat, when he hit a triple. Now that's a classy way to cross that symbolic threshold! See MLB.com. On March 25 I wrote that he ought to reach the big 3K around midsummer, then on April 11 I expressed doubt about whether he would break the 3,000-hit mark at all this year, since he wasn't getting much playing time with the Marlins. Things sure changed after that! He started hitting like in the old days, and he may end up playing a key role with the Marlins as they make a big push toward the postseason. Ichiro Suzuki batting at Target Field, August 1, 2010. Roll your mouse over the image to see a closeup. The Twins won that game, 4-0. While going through the photos I took that day, I realized that the batter in the "Target Field grand view" photo (on the Target Field page) was none other than Denard Span, who played with the Washington Nationals from 2013 to 2015, and joined the San Francisco Giants this year. Miami will play their last three games of the regular season in Washington from September 30 to October 2, so Ichiro may take a final bow in Nationals Park. Or the Marlins may make it to the postseason, in which case anything can happen! But wait, there's more mushrooms! Yesterday I wrote that I was pretty sure I had taken a photo of a rare "Dog Stinkhorn" mushroom two or three years ago. So, today I checked my iPhoto library and discovered that it was just a little more than one year ago: July 1, 2015. Jacqueline and I went for a long hike along the North Mountain trail that day, heading south from Parkersburg Pike at Dry Branch Gap in western Augusta County. We hiked about two miles, reaching a high point along Leadoff Ridge, where all of a sudden we encountered two bears that came crashing down out of a tree! So, we gave up on the idea of going all the way to Elliott Knob and turned back north. I had forgotten how many wonderful mushrooms we saw (and photographed) along the way. For some reason I didn't write a blog post about birding that day, even though I took a photo of a Black-throated Blue Warbler, plus we also saw a family of Ruffed Grouse. So, for the second time in two days, I have updated the Mushrooms photo gallery page, adding mushroom photos from 2012, 2014, and 2015. Mushroom montage, North Mountain, July 1, 2015. Roll your mouse over the image to see an enlarged view of the Dog Stinkhorn. There have been reports of a White Ibis in Bridgewater's Wildwood Park in recent days, so I drove up there this morning to take a look. It wasn't there, but I did at least see several good birds, such as a Yellow-billed Cuckoo and a Northern Flicker. There were also many Robins on the ground, including juveniles, plus a Pileated Woodpecker, Ruby-throated Hummingbird, and the usual woodland birds. On the downstream side of the dam, I saw a Great Blue Heron and a Spotted Sandpiper, plus many Mallards, a few immature Wood Ducks, and an ugly Muscovy Duck. After that, I drove to the park adjacent to the bridge over the North River. Lo and behold, there was the White Ibis! It's a juvenile, of course. (Adults are all white.) Like the Great Egrets and similar species, White Ibises breed along the east coast, and in the late summer the juveniles disperse into the interior regions in search of food. The last time I saw one was August 2014; there were two, actually. CLOCKWISE FROM TOP LEFT: Northern Flicker, White Ibis, Great Blue Heron, Spotted Sandpiper, and Yellow-billed Cuckoo, in Bridgewater, August 10, 2016. On the way home I stopped briefly at the part of Bell's Lane where the Green Herons have been seen, but none were there today. I did see a Great Blue Heron there, however. I also saw the usual Goldfinches, Indigo Buntings, and a House Finch; I took a nice photo of the latter. To see it and/or larger-size images of the birds in the above montage, go to: Wild Birds yearly. That was quite a matchup between divisional leaders in Washington this week! The Nationals and Indians split their second two-game series of the year, but given the starting pitchers, it was a surprise as to which team won on which day. On Tuesday night, Max Scherzer was at the top of his game, throwing a no-hitter until the seventh inning, at which point Francisco Lindnor singled and Scherzer committed an error that put a second runner on base. Then Jose Ramirez doubled, batting in one run, and Lonnie Chisenhall batted in a second run. Just like that, Scherzer's bid at a third no-hitter with the Nationals was transformed into a bitter defeat. Jayson Werth hit a solo homer in the eighth inning, but the Indians scored once again in the ninth, winning by a score of 3-1. Yesterday the Nationals got revenge with a big offensive outburst, led by Jayson Werth. He doubled in the first inning, thereby extending his consecutive-games on base streak to 40 games, the highest in the majors this year. He then scored, and with two outs in the second inning he hit a three-run homer to give the Nats a 4-1 lead. You'd think that would provide enough cushion for Gio Gonzalez to settle down and get some quick outs, but the Indians came right back and tied it in the top of the third. In the fifth inning, the Nats put together a classic multi-hit rally, featuring doubles by Daniel Murphy and Anthony Rendon, and a clutch go-ahead RBI single by Wilson Ramos. That guy has really been performing this year! Gio lasted into the sixth inning, at which point he allowed the first two batters to reach base, and Matt Belisle came in to relieve him, getting three quick outs. The rest of the bullpen held firm, and Mark Melancon got his second save since joining the Nationals. Final score: Nats 7, Indians 4. On the occasion of the Indians' first visit to Washington since Nationals Park was built, Tuesday's Washington Post had an article about the controversial "Chief Wahoo" mascot for the Indians. I'd be the first to agree that the image is a demeaning stereotype* and should be quickly phased out, but such things need to be seen in historical context. From the article, I learned that the grinning Indian face first appeared in 1947, which happens to be the very same year that the Indians moved into Cleveland Stadium on a full-time, permanent basis. The Indians were a long-suffering team in need of an image makeover, and the combination of the new mascot/logo and the "new" stadium (it's a long story) provided the catalyst for the Indians to win the World Series only one year later. Is there any wonder that the grinning Indian symbol held such a strong positive feeling for Cleveland baseball fans? On the broader topic of mascots, American pop culture was trending toward whimsical silliness from the late forties throught the late fifties, and clownish grins were par for the course. For example, the Baltimore Orioles have had a clownish bird face on their mascot for many years, off and on. In the 1950s, the St. Louis Cardinals likewise had a cartoon character cardinal as a mascot, as did their erstwhile "house-mates," the Browns. In that same era, the Washington Senators had a bespectacled politician wearing a three-cornered hat as an unofficial symbol. Cincinnati's "Mr. Red" and Queens' "Mr. Met" were similar, but were never official team emblems. After the 1980s, teams got carried away with silly cheerleading mascots, most notably the "Philly Phanatic" or "Youppi" in Montreal. The San Diego Padres did have a brown-robed friar as a mascot for many years, but it's likewise not on the uniforms or official displays. * In sharp contrast, I might add, to the dignified profile of an Indian chief used by the Washington Redskins. In Oakland, the Orioles managed to avoid being swept in a four game series by the lowly Athletics, who had won three consecutive games by one run each. Today, the Orioles took a 7-0 lead thanks in part to a grand slam by Mark Trumbo, but Oakland steadily came back, and in the bottom of the ninth had the tying run in the batter's box. He grounded out, and the Orioles won it, 9-6. If they had lost that one, it would have been devastating to team morale. The Orioles and Blue Jays are fighting neck and neck for the AL East lead, with the Boston Red Sox a couple games back. And in Fenway Park tonight the Bosox fell to the Yankees, 4-2, thanks to a home run in the eighth inning over the Green Monster by some guy named Austin Romine. Rapid rebuilding!? And in Chicago late this evening, the Cubs beat the Cardinals in 12 innings, as relief pitcher Zach Duke walked in the winning run after loading the bases. (Duke pitched for the Nationals a few years ago.) That was the Cubs' tenth consecutive win! After a lackluster month of July, they are headed back toward the stratosphere once again. The L.A. Dodgers caught up to the San Francisco Giants earlier this week, but then fell a game behind once again. This is more a reflection of the Giants' recent weakness than strength on the part of the Dodgers. Their erstwhile ace pitcher Clayton Kershaw has been on the disabled list for over a month, and probably won't be 100% back for a few more weeks. As explained below, I needed to confirm the height of the outfield seating section where Giancarlo Stanton's home run landed, and ended up having to make some revisions to the Coors Field diagrams. Most of the changes were fairly minor, and the most notable changes are the inclusion of "bends" in the grandstand. The lower deck is slightly bigger than previously estimated (there is a new separate lower deck diagram), and the lower concourse level is three feet higher relative to the field. This was prompted by a reply from Bruce Orser about the estimated length of Giancarlo Stanton's tape-measure home run last week. Given that the stands are three feet higher than I previously estimated, depending on the angle of the ball trajectory, it would have gone about 5 to 10 feet more than I originally estimated, i.e., pretty close to what hittracker.com estimated. I stand corrected. I noticed that on my semi-new My ballpark visits page, there was no jumbo-sized photo of Miller Park, as there are for all the other MLB parks I have visited. So, I added one. It's pretty spectacular. Inspired in part by friends from church who often play at parties or music festivals (see the photo below), I have been starting to play guitar in public over the last few months. "You're never to old to start!" Every Wednesday, Queen City Brewing hosts Open Mic Night, cosponsored by the Staunton Music Guild, which I "joined" a few years ago. (The SMG is very informal as an organization, but they do sponsor young musicians and hold occasional public events.) Fritz Horisk is the master of ceremonies, and plays guitar as well. I played there once in March, twice last month, and last Wednesday. The "Harvest Band"* performs for Peace Day 2014, September 21, at Gypsy Hill Park in Staunton. We were playing Bob Dylan's "Blowing In the Wind," a popular protest song from the 1960s. It was the first time I played harmonica in public. On the left is Randy Hamblett (banjo), in back is Colin Hester (bass), and on the right is Matthew Poteat (mandolin). Thanks to Jacqueline for taking the photo. * The "Harvest Band" is what we folk musicians call ourselves whenever we perform at Emmanuel Episcopal Church services. It's been over a year since the last time we did that, however. My first Open Mic Night was back in March, during spring break. Otherwise, my class schedule conflicted with Wednesday nights. My first time didn't go so well, as my brain somehow froze and I forgot chords on two of the songs ("Colorado Song" and "Bitter Creek"), despite the fact that I knew those very well. I guess that's what they call stage fright. I also had a hard time changing the tuning on two of the strings after the first song. Part of the reason for being flustered was that I forgot to bring my harmonicas, forcing me to change my set list at the last minute. I at least managed a decent job on "Tequila Sunrise." I planned to resume playing in late May or June, but I didn't do a second appearance until July 13. This time I had my harmonicas with me, and was accompanied by my loyal and supportive wife Jacqueline. There weren't many people there, however, probably just 10-12, including the musical performers. The second and third songs ("Standing On the Rock" and "Follow You Down") went pretty well, but I had problems with the other two, hitting the right harmonica notes on "Country Girl" and having a hard time reaching high notes singing on "Doolin' Dalton." My [fourth]* appearance was on August 10, two nights ago, and Jacqueline was there once again. The harmonica on "Ring of Fire" takes the place of the brass quartet which Johnny Cash used on the original recording, and it yields a pretty good effect. (I have learned to play harmonica instead of the "original" instruments on many other songs, some of which might surprise you.) Sad to say, I missed a few notes on "Harvest Moon," which is a shame, since it's a beautiful song. But the last two songs by one of my favorite groups came across pretty well, even though they were not familiar to folks in the audience. I look forward to playing at Open Mic Night in the weeks to come, time permitting, and perhaps at some other public venues. From that Nickelback song: "Hey, hey, I wanna be a rock star!" * Corrected on August 27; originally I wrote "third." About three years ago I started learning how to play the harmonica, and I'm gradually getting better at it. Given the fact that I have been a big fan of the Ozark Mountain Daredevils since the very beginning (I saw them in concert in Vermillion, South Dakota in the fall of 1974), it is odd that it took me so long, since the harmonica is one of their "signature" instruments. So, I finally bought myself a harmonica, a cheapo Hohner model in the key of C. Many songs I play have a harmonica part in them, including ones by the Beatles, Bob Dylan, and Neil Young, and it sounds much better playing the guitar simultaneously with a harmonica. Within a few months, I was ready for better-quality models, which cost about $15 to $18. Within a year, I was proficient enough to play in public. (See photo above.) Now I am sufficiently particular to want high-quality harmonicas, which cost about $40. I already have two Hohner Marine Band models ("D" and "E"), and two Lee Oscar models ("A" and "G"). I need to get a high-quality "C" harmonica, and eventually a "Bb" and "F" as well. The custom-designed harmonica case which I built in March 2014, using a cigar box purchased at an antique store, plus materials purchased from Michaels craft store in Waynesboro and the Tru Valu hardware store in downtown Staunton. Cross-harp / second position keys (where the root note of the scale is drawn rather than blown) are in parentheses, and corresponding minor keys are in brackets. Standard harmonicas have ten holes, each of which plays a different note when drawn rather than blown. When blowing, the major triad of the chord occur in succession. For example, in a "C" harmonica, the blow notes are C - E - G repeated three times at successively higher octaves, plus a high C. Since each adjacent pair of notes is by definition part of the same chord, you can slide up and down while blowing, and it will sound OK. Drawing notes is a different matter, however. Because there needs to be at least one complete octave scale in order to play most songs, there are some irregularities and "gaps" between some of the holes. As the table below shows, most adjacent note pairs are part of a chordal harmony, with one big exception: #6 and #7! They are only one note apart (A and B, in a "C" key harmonica), and there are no chords with adjacent notes, other than 7th chords and other chords with a fourth note. Usually, it doesn't matter if you are trying to play a particular note but also get an adjacent note, since they are generally in harmony. You have to learn to avoid drawing on #6 and #7 simultaneously, because it will sound terrible! The bottom line shows the difference between blown notes vs. drawn notes. ("1" = a full note, or two half steps on a fretboard.) As you will notice, the six holes on the left (#1 - #6) produce higher notes when drawn (compared to when blown), while the four holes on the right (#7 - #10) produce lower notes when drawn. A further inspiration for my harmonica playing was seeing the Blues Travelers postgame concert at Nationals Park on June 8, 2014. The group's leader, John Popper, is a phenomenal harmonica player. I'd love to learn how to play some of that group's songs (such as "The Runaround"), but the problem is that he changes notes much more quickly than I can. John Popper, leader of the Blues Travelers at Nationals Park, June 8, 2014. The trail at Blackrock, with a view of the Shenandoah Valley. Last week (August 8) I added a montage of mushroom photos that I had originally taken on July 1, 2015. There's probably many more in my collection that I haven't identified yet... Anyway, Jacqueline and I saw quite a few mushrooms along the Appalachian Trail during our Sunday hike, of which the most impressive was a small, frilly purple mushroom which I identified as Ramaria Fennica. So, for the third time this month, I have updated the Mushrooms photo gallery page. The front side (east) of Swannanoa Palace. Swannanoa Palace was built in 1912 or so by Major James Dooley, who had served in the Confederate Army during the Civil War. But he and his wife Sally May passed away during the 1920s, and the property was bought and the adjoining land was made into Swannanoa Country Club. In 1944, A.T. Dulaney led a group which purchased Swannanoa, and in 1948 the palace was leased to Walter and Lao Russell, the founders of the University of Science and Philosophy, a kind of New Age movement before its time. See philosophy.org. Their lease expired in 1997, and since then the palace has been in a state of limbo, in desperate need of repair and renovation. Yesterday, Jacqueline and I drove up to Bridgewater, but I couldn't find the White Ibis which I had seen last week, and which was reported to be lingering in that area for a few more days. I did see an immature Bald Eagle fly directly overhead, however. At Leonard's Pond there were a dozen or so Killdeers plus a solitary Solitary Sandpiper. On August 14, Jacqueline and I went hiking in the Shenandoah National Park, along the Appalachian Trail from Blackrock Gap to Blackrock, which is a pile of boulders with some great views toward the north and west. There weren't many birds that (very hot) day, but we did see a couple Blue-gray Gnatcatchers, White-breasted Nuthatches, Cedar Waxwing, Red-eyed Vireo, and a couple Eastern Towhee. (See the montage on the Wild Birds yearly photo gallery page. I'll make a separate blog post with photos of mushrooms and scenery.) Around Blackrock, our destination, there were quite a few Barn Swallows swooping around. After the brutal setback in the Mile High City (see below), the Nationals had to catch a flight to Atlanta and play on Thursday without a day of rest. (Who made that schedule?) Once again, rookie pitcher Reynaldo Lopez pitched like a true champion, getting his second career win as the Nats prevailed easily, 8-2. It was actually close for most of the game, 3-2 until the eighth inning, when the Braves bullpen melted down, giving up runs in every conceivable way. The Braves actually outhit the Nats in that game, the opposite of what happened in Denver the day before. Jayson Werth got two hits, extending his streak of consecutive games reaching base safely to 46, tying the franchise record set by Rusty Staub. That was a huge accomplishment for which Werth should be proud; see MLB.com. Last night (Friday), the Nats took a 2-0 lead in the first inning when Matt Kemp (recently acquired in a trade with San Diego) dropped a long fly ball to the left field corner, and both base runners scored. Tanner Roark had another solid outing, giving up 3 runs in 7 innings, but then the bullpen buckled, and the Nats were lucky to escape with a 7-6 win. (Deja vu; see below. )* The Braves scored 3 runs in the eighth inning in part due to uncharacteristically sloppy errors by shortstop Danny Espinosa and third baseman Anthony Rendon. The two heros of the game were Ben Revere, who robbed Freddy Freeman of a home run with a spectacular leaping catch in the middle innings, and Clint Robinson, who hit a clutch RBI single with two outs in the top of the ninth inning. That run decided the game. On a melancholy note, Jayson Werth failed to reach base for the first time in 46 games. So, the Nationals are now 9.5 games ahead of the Marlins in the NL East, a lead almost as big as that of the Chicago Cubs in the NL Central (12 games). The NL West has become a virtual tie between the L.A. Dodgers and S.F. Giants over the last few days, as has the AL East, where Toronto Blue Jays have taken a half-game lead over the Boston Red Sox; the Baltimore Orioles are close behind. The Texas Rangers and Cleveland Indians continue to hold wide leads in the AL West and AL Central, respectively. As MASN's F.P. Santangelo wisely said a few days ago, it's not the team's cumulative win-loss record that defines how good they are, but rather their record for the last few weeks. It happens that the Colorado Rockies are one of the hottest teams in baseball since the All-Star break, and they showed it during the three-game series in Denver against the Nationals. On Monday, August 15, Max Scherzer had another off day, and left the mound after just four innings. But home runs by Jayson Werth and Wilson Ramos proved to be the deciding factor in the Nats' 5-4 victory. The start of the Tuesday game was delayed by two hours because of rain, which was unusual, because central Colorado has been very dry this summer. The resurgent Anthony Rendon went 3 for 4, but his team mates didn't do as well at the plate. Starting pitcher Gio Gonzalez lasted only three innings, but it was the Nats' bullpen that let the team down, as the Rockies ended up winning, 6-2. On Wednesday afternoon, Stephen Strasburg had the very worst outing of his entire career, giving up seven runs in the first inning, and two more in the second, which he didn't even finish. To their credit, the Nationals fought back bravely against all odds, but the Rockies scored three runs off Oliver Perez in the fifth inning, which ended up deciding the outcome. The Nats scored runs in seven of the nine innings, which might be some kind of team record, but no more than two in any one inning. Final score: Rockies 12, Nationals 10. Amazingly, the Nats got more hits (13) than the Rockies did (11). I hate to say it, but Oliver Perez is not getting the job done as a relief pitcher. Nationals outslug Braves in D.C. In the final three games of their home stand in D.C., the Nationals put together some fine, consistent hitting, sparked by Trea Turner, Anthony Rendon, and Daniel Murphy. But in the opening game of the series, Friday, August 12, Stephen Strasburg once again showed he couldn't take the intense heat and humidity of a day game in Washington. You'd think someone who grew up so close to Mexico (San Diego) would be used to it, but the air is drier out west. Strasburg gave up 6 runs over 5 1/3 innings, and the Nats lost, 8-5. The next day, rookie pitcher Reynaldo Lopez was under heavy pressure to make up for that lapse, and he delivered like a true champion. *He gave up only one run in 7 innings, but then the bullpen buckled, and the Nats were lucky to escape with a 7-6 win. In the Sunday finale, the outcome was never in doubt, as Tanner Roark pitched seven strong innings, and the Nats won, 9-1. I was surprised that Jonathan Papelbon (a.k.a. the "D.C. Strangler") managed to play a constructive role in the Nationals' bullpen for as long as he did this year. Forgive and forget, I suppose. But as the summer wore on, his effectiveness steadily declined, with so many blown saves that confidence in the bullpen as a whole was on the verge of collapse. After Mike Rizzo made the deal to acquire Mark Melancon in late July, there was no role left for Papelbon to play, and last week he requested and was granted an unconditional release by the team. In his place, Reynaldo Lopez was called up from the minors. (MLB.com) Where might he end up: with the Boston Red Sox again? Many things are possible. The Miami Marlins' star slugger Giancarlo Stanton suffered a serious injury to his groin while sliding into second base last week. As a result, he will be out for at least a few weeks, possibly for the rest of the season. That means that Ichiro Suzuki will get lots more playing time in right field. There were rumors that the Marlins might acquire the services of recently retired Alex Rodriguez as an emergency replacement, but nothing came of it. See MLB.com. It probably takes some of the pressure off the Washington Nationals, but it will also take away the thrill of watching a possible future Hall of Famer for thousands of fans in Miami and elsewhere. I hope he gets well soon. Football season is just a few weeks away, and they have already begun broadcasting preseason games on TV, which I think is stupid. The Los Angeles Rams played their first game at L.A. Memorial Coliseum since returning to Los Angeles, and Mike Zurawski sent me a batch of links regarding the upgrading of that venerable old facility. (The Rams pulled off a crowd-pleasing come-from-behind win over the Cowboys, for whatever that's worth.) A total of 89,140 were in attendance, setting an NFL preseason record. (See NFL.com.) The Rams constructed 20 temporary luxury boxes blocking the peristyle arches, the architectural feature that best defines the Coliseum. I think that was a dumb move. An image from those new luxury seating areas can be seen on the ABC TV affiliate in L.A. You can also see a huge gallery of photos from the game at dailynews.com. So, I got to work revising the diagrams, and of course it has taken longer than expected. Stay tuned! It was pretty clear from Stephen Strasburg's recent poor performances that he has had some kind of physical ailment, and indeed today we learned that he has a sore elbow and will be on the disabled list for 15 days. Strasburg says it's not serious, and this is probably just a precautionary move to make sure that he is in top condition to make a big playoff run six weeks from now. See MLB.com. So why didn't he ask to be taken out of the rotation sooner? After amassing a 15-1 record on August 1, with a 14-1 stomping of the Diamondbacks, Strasburg lost his former dominance and was the victim of multi-run attacks. In Washington on August 6 he lasted only 4 2/3 innings in a 7-1 loss to the Giants, on August 12 he went 5 1/3 innings in an 8-5 loss to the Braves, and in Denver on August 17, he only lasted 1 2/3 innings, giving up 9 runs. (Final score 12-10.) So now his record is 15-4, and his chances of winning the Cy Young award are going down the tubes. After the spectacular first three and a half months he had this year, it's a real shame. To replace Strasburg, A.J. Cole was called up from the minors and performed extremely well on the mound in Baltimore this evening. He struck out three of the first four batters he faced, and showed very good command during seven full innings, but two home runs were all it took for the Orioles to win tonight, 4-3. Anthony Rendon and Danny Espinosa hit solo homers, but the Nats went 1 for 9 with runners in scoring position. Wilson Ramos, Bryce Harper, and Ryan Zimmerman all share the blame for those missed opportunities. I checked my Nationals Media Guide and learned that Cole was the starting pitcher in the memorable April 28, 2015 game in Atlanta when the Nats overcame a 9-1 deficit after two innings to beat the Braves, 13-12. It's not something that a pitcher wants to be remembered for. That game was a lot like the Nats-Rockies game last week, in fact! Cole pitched as a reliever twice in May last year, and got one save, evidently showing improvement. In the two weekend games, the Nationals built comfortable leads over the Braves, but in both cases the home team made spirited comebacks. The Nats bullpen was already fatigued after the short outings by Scherzer, Gonzalez, and Strasburg last week, and not having a travel day between the series in Denver and Atlanta only made things worse. On a bright note, Ryan Zimmerman hit a home run in his first at bat since returning from the disabled list, and got two more hits after that. Daniel Murphy and Trea Turner also homered, and the extra runs came in handy as the Braves closed the gap in the late innings. Final score: 11-9. Seriously, was there ever any doubt? An investigation by MLB officials found that neither Ryan Zimmerman nor Ryan Howard (of the Phillies) have used performance-enhancing drugs. Those reports by Al Jazeera (see Jan. 11) were without any foundation whatsoever. It was a nice coincidence that the news came out just as Ryan returned to the Nats' lineup after a couple weeks on the DL. See the Washington Post. In discussing the series in Denver last week, I should have mentioned that Bryce Harper hit another tape-measure home run. (Bruce Orser wanted to make sure I knew about that!) It was during that Wednesday afternoon game where they Nats were struggling to come back from an early 9-2 deficit. According to hittrackeronline.com, it would have gone 481 feet, and that's about what I would say. The ball landed a few feet to the right of the left-most entry portal in the second deck of Coors Field, just to the right of the evergreen tree "park" beyond center field. The ball flew about 450 feet in the air, and landed about 38 feet above the ground. The high-elevation no doubt added at least 20 feet to the distance the ball would have flown under normal conditions. It went about  feet farther than the blast Harper hit to the upper-deck in right field in Nationals Park last month. On Saturday, Jacqueline and I went for a day trip to the eastern part of Virginia along the Chesapeake Bay, one of those destinations we had planning for a long time. It was a combination of interest in the history of the Old Dominion, wanting to see some different scenery, enjoying fresh seafood, and (in my case) watching birds in the wetlands along the Chesapeake Bay; see the separate wild birds blog post. We accomplished most of our objectives. New Kent monument to fallen soldiers from the Civil War, and the historic "ordinary" across the street. "Lest we forget: Pamunkey Rifles, Barhamsville Grays, New Kent Cavalry." The Robert O. Norris Bridge, over the Rappahannock River. I did not realize it at the time, but there are apparently serious concerns over the structural integrity of that bridge, which was built in 1957; see nbc12.com. Anyway, that took us from Lancaster County into Middlesex County, into the part of the state known as the "Northern Neck," between the Rappahannock and Potomac Rivers. We stopped for ice cream in the town of Kilmarnock, and I briefly explored a nature trail along a lily-covered pond on the north side of town. After a few more miles, we left the main highway (Route 200) and ventured east toward the Chesapeake Bay shoreline, arriving at Hughlet Point Natural Area after a while. I went exploring while Jacqueline rested, and she had a good reason for not joining me: Biting flies were everywhere! A boardwalk trail led through a dense wooded area, which opened up as the soil turned to sand. I could hear the waves, and rushed over to the beach, the first time I have been to the sea [or in this case, an appendage thereof] in nearly two years. That was nice. Then I trotted southward along a trail parallel to the beach, arriving at one of the observation platforms after five minutes or so. I was swatting away flies the whole miserable time along the trail. I was using insect repellant, but obviously not enough. Next we headed north to the Dameron Marsh Natural Area, about ten miles to the north. It was a little trickier to get to, with a gravel road as the only access. The observation platform there was closer to the parking area than at Hughlet Point, so that saved some time, but the biting flies were just as bad. With lush marsh grasses everywhere around, this was a somewhat more photogenic spot than Hughlet Point. In the distance, I could see the port town of Reedville. But it was getting late in the afternoon, so I had to leave in a hurry. Dameron Marsh Natural Area, an Osprey, and the Chesapeake Bay beyond. We headed north again, and stopped for gas in the town of Wicomico Church, where I took some photos. The church itself (as opposed to the surrounding town) is an Episcopal Church, which is typical in that very Anglo-Saxon, very established part of the Old Dominion. After crossing the Wicomico River, we came upon U.S. Route 360, which terminates just a few miles east of that corner in the town of Reedville. That is where the ferry boat to the island community of Tangier docks. (Maybe we'll go there next time.) Instead, we turned left, toward the west. We were looking for steamed crabs to take home with us, and finally spotted a van with "Mr. Crab" in big letters. BINGO! The vendor (an African-American) was very nice, giving us a special price since all the big-sized crabs had been sold, and added a few extras to the dozen that we paid for. We had a great meal the next day! When I lived in Northern Virginia back in the 1980s, we used to eat at Ernie's Crab House in Arlington, and it has been years since I have eaten whole steamed crabs like that. Yum!!! Anyway, we passed through the town of Heathsville and then Callao, where I took a bunch of photos of various stores. Why? Because Callao is the name of the port district of Lima, Peru, where Jacqueline grew up. It was in Northumberland County that we saw most of the birds that day. Other photos from our trip can be seen on the new Chronological photo gallery (2016) page, which will eventually encompass all years back to 2003. (It is part of a general website reorganization project of mine.) That page also includes several more photos that I took at Swannanoa Palace one week earlier. As noted in a separate travel-oriented blog post, one of the reasons for the day trip which Jacqueline and I took to the Chesapeake Bay on Saturday was to look for birds that frequent marshy areas along the coast. In particular, I was hoping to be there for the release of a Bald Eagle that had been rehabilitated by the Wildlife Center of Virginia, located south of Waynesboro. The release took place as scheduled at Belle Isle State Park in Lancaster County (see wildlifecenter.org), but between traffic delays (near Richmond) and various "touristy" diversions, we just couldn't get there on time. I was sad to miss the opportunity to witness that, but we had a nice consolation prize. While approaching one Dameron Marsh, one of the natural havens along the Chesapeake Bay, we encountered a Bald Eagle in a tree right in front of us! I was spellbound, and quite happy to get such a nice, well-lit photo. Among the other birding "highlights" that day, one was rather frustrating: I saw numerous Greater Black-backed Gulls and Double-crested Cormorants perched along the Robert O. Norris Bridge, which crosses the Rappahannock River. It would have been an excellent photo op, but there was no place to park on the bridge. At the first of the two nature preserves we visited, Hughlet Point, I heard a distinct chipping call in the trees, like an Indigo Bunting. Then I saw something moving and got a clear view of a male Blue Grosbeak, the first one I've seen this year. From the observation deck, I saw several Ospreys, gulls, and what I thought were small sandpipers. My field guide says there are no sandpipers that breed along the mid-Atlantic coast, however, so I'm guessing they were either Wilson's Plovers or Piping Plovers. I'll have to check to see which one is more likely. At Dameron Marsh I saw a Ruby-throated Hummingbird just a few feet away, as well as a probable Yellow-billed Cuckoo. Unfortunately, I didn't see any of the specialized coastal herons (Tricolored Herons or Little Blue Herons) I had hoped for, so I'll have to devote more time and preparation to find those birds the next time I'm in that region. CLOCKWISE FROM TOP LEFT: Osprey, Laughing Gull, Bald Eagle, American Goldfinch, Double-crested Cormorants and possible Royal Terns, and in the center, Great Blue Herons and a Killdeer. Roll your mouse over the image to see an enlarged view of the Bald Eagle. On Tuesday rookie pitcher Reynaldo Lopez was overwhelmed by the Orioles' slugging power, in sharp contrast to the game he pitched in Atlanta last Friday. This time he only lasted 2 2/3 innings, giving up six runs, of which four were earned. At least he showed a good measure of composure under high stress. The only bright spot for the Nationals was that rookie Trea Turner went 4 for 4 at the plate. Final score: Orioles 8, Nats 1. On Wednesday, as the series switched back to Washington, the usually reliable Tanner Roark had control problems from the get-go, hitting a couple batters and giving up four runs in the first inning. He gradually settled down, but with a pitch count of over 110, he couldn't stay in past the fifth inning -- tired bullpen or not. The Nats narrowed the gap to 5-3, and had perfect scoring opportunities in both the sixth and seventh innings, but their bats turned cold at just the wrong moment. In the eighth inning, Blake Treinen took the mound for the Nats, and a disaster quickly unfolded. Before you knew it, the Orioles tacked on five more runs, making it a seemingly hopeless 10-3 game. No Nats reached base in the bottom of that inning, and the outlook couldn't have been bleaker. But somehow they got their mojo back and started getting hits in the bottom of the ninth, loading the bases for Daniel Murphy. BOOM! His very first career grand slam made it a 10-7 game, with just one out. Then Bryce Harper singled, and Anthony Rendon doubled to make it a 10-8 game. Wilson Ramos reached base on a weird infield fielder's choice play, and Rendon made it to third. Then up to the plate came Ryan Zimmerman, "Mr. Walkoff" himself, and those Nats fans who had not already left the ballpark were filled with breathless expectation of a comeback win of truly historic proportions. But Ryan swung at the first pitch, a hard ground ball to the second baseman, and the game suddenly ended on a double play. That was a big letdown, but the big comeback effort meant a lot for team morale, and probably gave them a boost in today's game. Also noteworthy is that Trea Turner got hits in his first four at bats, making 8 consecutive at bats with a hit, tying a franchise record. He struck out the last time up, in the ninth inning. By salvaging one game out of that series, the Nationals kept a big lead in the division over the Miami Marlins, who lost to the visiting Kansas City Royals tonight. The lead grew from 7 to 8 games. If the Orioles had completed the sweep, there would have been a three-way tie for the AL East lead; instead they are one game behind the Red Sox and Blue Jays. On the west coast, meanwhile, the Dodgers built a three game lead over the Giants, but the Giants have a 4-0 lead over the Dodgers in the ninth inning right now. 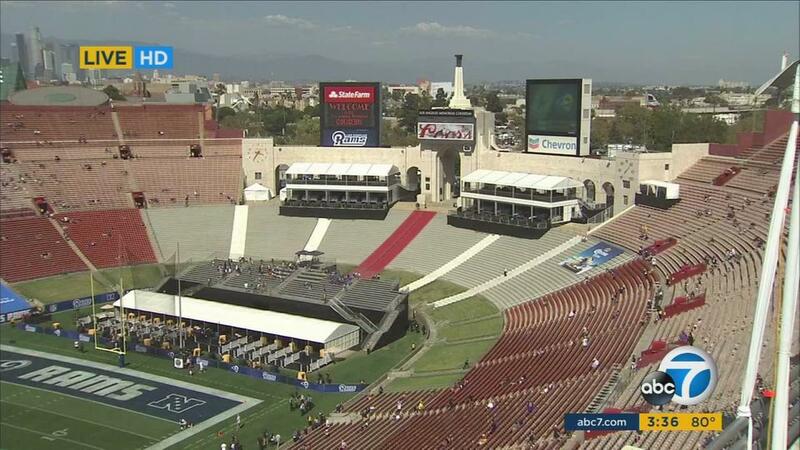 Mike Zurawski informs me that L.A. Memorial Coliseum -- the once-again (though temporary) home of the Los Angeles Rams -- will undergo a $270-million renovation, to be financed by the University of Southern California, a private institution. They will build a multi-level tower of luxury boxes, and the seating capacity at USC Trojan games will be reduced from 93,600 to 77,500. latimes.com. On Facebook recently, I came across a news story about a push in the 1960s by Boston leaders to build a 53,000-seat multi-sport stadium near South Station, replacing Fenway Park. At the time of the AFL-NFL merger, the NFL was requiring that all franchises have stadiums with at least 50,000 seats, and the Boston Patriots' home in Fenway Park just could not cut it. A replacement for the old Boston Garden was also part of the master plan, which fortunately did not come to pass. Can you imagine the Red Sox playing in a boring cookie-cutter stadium? The failure of that initiative is what led to the [town] of Foxborough [a.k.a. "Foxboro"] jumping in with a stadium offer of their own, and upon moving in 1971, the Boston Patriots became the New England Patriots. See boston.com. Historic night for Nationals in D.C.
As the series against Colorado began this evening, Jayson Werth got things started off right with a solo homer in the first inning tonight, his second in two nights and his sixth of the month! But the Rockies came right back with a run in the top of the second, and likewise replied in kind after the Nats scored a run in the third inning. The Nats took the lead for good in the fourth inning, but it was on a bases loaded ground-into-double-play, hence no RBI for Jose Lobaton. Daniel Murphy hit a solo homer in the fifth, and the Nats tacked on four insurance runs in the seventh inning, two of which came on a Bryce Harper triple -- his first of the year! In the top of the ninth, Shawn Kelley gave up a three-run homer to Nick Hundley, and Mark Melancon had to finish the game, just in case. Final score: Nats 8, Rockies 5. It was the 100th career victory for Gio Gonzalez, who pitched for six innings. Daniel Murphy also had a historic milestone, getting the 500th RBI of his career. See MLB.com. It's worth noting that Trea Turner's hitting ability and fast base-running led to three errors committed by the Rockies. He is proving to be an invaluable asset to the Nationals as the 2016 season heads into the final stretch. Before the game, former Washington Senator Frank Howard was honored by having his name added to the "Ring of Fame" that adorns the facing of the second deck in Nationals Park. About time! A statue of him swinging a bat already adorns the main plaza beyond left field in Nationals Park. It was fun watching him be interviewed by Phil Wood, who does radio commentary on FM 106.7 and sometimes TV commentary on MASN. Howard autographed a book for me at the SABR convention in Washington several years ago, and I can attest that he is a friendly guy who loves baseball and loves Washington. The Nats expected to gain a game on the Marlins in the NL East tonight, but the relief pitchers for the Padres gave up five runs in the final three innings, and the home team in Miami won the game. Hoping to strengthen their wobbly and worn-out bullpen, the Nationals traded minor league infielder Max Schrock (and cash) to the Oakland A's for left-handed pitcher Marc Rzepczynski. (Transactions after August 1 are subject to waiver clearing, of course.) Rzepczynski had a 3.00 ERA with Oakland this season, with 37 strikeouts in 36 innings. He excels at inducing ground-ball outs. See MLB.com. In tonight's game against the Rockies, Rzepczynski struck out the one batter he faced. Of the six home series sweeps, the Nats won four and lost two. Of the 11 away series sweeps, the Nats won six and lost five. The Nats have been involved in three series sweeps with both the Braves (winning each time) and the Cubs (winning just once). For "Wicked Game," I use the harmonica to play the lead guitar parts. I can sing the low notes on that one pretty well, but it's a challenge for me to reach the high falsetto notes, since I have a limited vocal range. This time I pulled it off well enough. The next two songs went pretty well. On the last one ("Rhythm of Love"), I missed a few notes on the intro riff, to my annoyance. (Jacqueline noticed.) Since there were fewer performers, each of us got to do an extra song, and I hadn't prepared well enough for this one. Practice, practice, practice... I mentioned to the audience that Jacqueline and I had seen the Plain White T's do that song in a post-game concert at Nationals Park two years ago. I used the harmonica on the first two songs, and my rendition of "Interstate Love Song" with it truly rocks, if I may say so. I try to play at least one relatively recent song (in this case "only" 22 years old) at each appearance to offset my heavy concentration in 1970s-era acoustic/country rock. I took a risk playing "Never Goin' Back," which involves some tricky guitar picking techniques, but it turned out OK. I talked about the Fleetwood Mac concert that that Jacqueline and I had seen last year, paying tribute to Lindsey Buckingham's guitar virtuosity. The audience applauded enthusiastically for all three of my songs, as they did for the several performers after me. Top-notch entertainment, and I was proud to be part of it. It seemed to me that the audience was especially attentive to the music that night, which is not always the case. Common Gallinules are misnamed for two reasons: First, they used to be called Common Moorhens, creating confusion among birders. Second, they are not common at all; see note at bottom. * So when I saw an e-mail alert about one of them at Willow Lake, south of Raphine in Rockbridge County, I just had to go see for myself. When I arrived at about 9:30 this morning, two other local birders, Tom Pendleton and Elaine Carwile, were already there, and they told me the bird had just retreated to the reeds, out of sight. So, I prepared myself for a long vigil, much like when I saw the Sora at Nazarene Wetlands last month. ** In the mean time, I watched and photographed other birds around the lake, some of which are in the photo montage below. Eventually, after Elaine had to leave, Tom spotted the target bird, and we both started snapping photos like crazy. Hallelujah! CLOCKWISE FROM TOP LEFT: Cedar Waxwing, Eastern Meadownlark (juv. ), Eastern Phoebe, Osprey, Green Heron (juv. )*, Common Gallinule, and Eastern Kingbird. * Image reversed left to right for aesthetic reasons. Common Gallinule, at Willow Lake today. Roll mouse over the image to see it swimming. After Tom left, I waited a while longer, and saw the Common Gallinule fly above the lily pads briefly, and later it started swimming toward my side of the lake. I took a couple quick photos and carefully crouched and approached the shore behind some tall weeds in hopes of getting a better shot, but it must have seen me and fled. Oh well. So then I went over to nearby McCormick's Farm, where I saw two juvenile Green Herons on the back pond, and was able to get very good photos of them. Not a bad day, bird-wise! So, of course, I updated the Wild Birds yearly photo gallery page. It shows a flash-assisted photo of a young male Ruby-throated Hummingbird that I took four days ago. We usually start getting hummingbirds in "our" back yard around mid-August, but hardly ever before that. ** Apparently no one picked up on the "literary" allusion in the blog post title "Soras breeding in the Valley!" It comes from a parody song in the Pogo comic strip by Walt Kelly, which was big in the 1950s and 1960s. (My Dad loved it.) Sung to the tune of "Deck the Halls," the second line goes "Nora's freezing on the trolley," instead of "Tis the season to be jolly." See Cecil's straightdope.com. Just when you think the Washington Nationals have finally gotten on the right track, something goes wrong again. With two of their five starting pitchers on the DL, they had to rely on rookies again two games in a row. On Saturday, A.J. Cole took the mound and did fairly well, giving up three runs over 5 2/3 innings. But the Nats' bats were mostly cold once again, and they were behind 4-3 with two outs in the bottom of the ninth inning. Jayson Werth came up to bat, and with two strikes against him, he belted an RBI single to left-center field, tying the game. Absolute clutch hit! The Nats had a chance to win it in walk-off fashion [after Werth reached third base on a wild pitch, but Daniel Murphy grounded out.] Mark Melancon pitched in the [top of the] 10th inning, [and Bryce Harper was ejected after lashing out at the umpire who called him out on strikes], but neither team scored. In the 11th, Yusmeiro Petit took the mound and gave up home runs to both Charlie Blackmon (his second of the night) and Carlos Gonzalez, plus one more run after that. What an appalling disaster! The Nats got two runners on base in the bottom of the 11th, but nothing came of it. Final score: Rockies 9, Nationals 4. The loss to the visiting Colorado Rockies was most distressing. The game was almost a carbon copy of the July 2 game (see July 4 blog post), when the Reds beat the Nats 9-4 in 10 innings, after the Nats made a similar heroic comeback in the late innings to tie it. That time, Sammy Solis and Matt Belilse were to blame. On Sunday afternoon, the widely-hyped rookie pitcher Lucas Giolito got the start, and was lucky to escape the first inning giving up only one run. On the first pitch in the bottom of the first, rookie Trea Turner homered to tie the game 1-1. But Giolito gave up a three-run homer in the [third] inning. Wilson Ramos hit a solo homer in the seventh inning, and Bryce Harper did likewise in the ninth inning, but it wasn't enough. Otherwise, the Nats just weren't hitting. Final score: 5-3. There was a weird play in which a Rockies player scored from second base on a wild pitch, when the umpire was keeled over in pain, and nobody paid attention to the base runner rounding third base. It was a questionable move on his part, and fortunately, the extra run didn't matter in the end. New name: "Hard Rock Stadium"
So, I made a new diagram showing the new configuration of what was once called " Dolphin Stadium." For the time being, it does not include the bare frame roof extensions (about 20 feet? ), which apparently are intended to support a canvas awning when more shade is desired. It also does not include the extreme corners of that rectangular roof, which extend beyond the existing diagram parameters. The new diagram is subject to revision, once I have seen more photos. Prompted in part by that news item, I updated the Stadium names page, including the new name of the White Sox' home (Guaranteed Rate Field) mentioned four days ago. I have also made it less "judgmental," replacing the categories of "Bogus" and "Suspect" with "Brief" (in use for four years or less) and "Medium" (in use for five to nine years) categories; most but not all of them are sponsored. I may fiddle with the definitions of those categories and revise that table again. I also intend to do a separate page showing the year-by-year chronologies of those stadiums whose names changed most often. * The Beehive (Braves Field) and White Sox Park (Comiskey Park) were only labeled "suspect" because the names reverted to the original after a few years. I wasn't sure, so I checked and learned that Anheuser-Busch entered into a 20-year naming rights contract with the St. Louis Cardinals in August 2004, when construction on their new stadium was getting underway. See bizjournals.com. "Financial terms of the deal were not disclosed." Somehow I missed this, but apparently the U.S. Supreme Court killed the idea of the Oakland A's moving to San Jose once and for all last October. In their legal reasoning, they rejected claim that "Major League Baseball has used illegal monopoly powers to block the relocation." See sfgate.com. That's bad news, not just for Athletics fans, but for baseball in general. If MLB franchises can get away with leveraging their protected status so as to bilk fans and local governments without limit, the fan base will steadily shrink, while the blatant unfairness of it all will eventually kill public support the sport. So now, the A's are back to working on some kind of deal with Oakland, which is not prepared to be generous, or else move somewhere else, such as Las Vegas. Yuk. One of the few bright spots in the Nationals pitching staff right now is Max Scherzer, who had an uneven first half of the 2016 season, but has been returning to form since the All-Star break. Last night in Philadelphia he had a no-hitter going into the sixth inning, when Freddy Galvez hit a double. In the seventh inning, Ryan Howard hit a two-run homer, but Scherzer stayed in for another inning and ended up with 11 strikeouts. The two runs scored by the Nats in the first inning gave him a small but vital comfort zone, and ironically, it was an RBI sacrifice bunt in the fourth inning by Scherzer himself that ended up being the deciding run in the game. Mark Melancon got the save in spite of walking the first batter in the bottom of the ninth. Final score: Nats 3, Phillies 2. See MLB.com. So who is this Gary Sanchez? In the Bronx section of New York, some rookie named Gary Sanchez has been setting all sorts of records, including two consecutive American League Player of the Week awards. He has hit 11 home runs over the last 30 games, which is just insane for a rookie. Well, the Yankees are desperate for a new generation of heroes of the Ruth-Gehrig-DiMaggio-Mantle-Jackson-Jeter caliber. Maybe Sanchez is it. And maybe I'll get to see him in a few days! (See note below, and MLB.com.) The Yankees are not out of the AL Wild Card picture, and a lot can change in the standings as the final month of the 2016 season gets underway. If it weren't for Sanchez, the Nationals' red-hot rookie Trea Turner would have been getting such honors. Those include two Nationals games, visiting (respectively) the Phillies tonight and the Mets on Sunday evening. The Red Sox will be out of town, so I'll have to content myself with a mere tour of their home. It's too bad, as I was hoping to see David Ortiz in his final MLB year. Stay tuned for lots of great new photos!